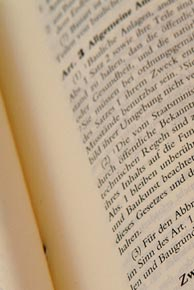 You can find the respective legal provisions relating to the profession under the heading "Berufsrecht (Berufsregeln)" on the homepage of the Federal Bar Council under www.brak.de. According to the Federal Lawyers' Act (BRAO), lawyers are obliged to carry a legal malpractice insurance with a minimum insurance cover of Euro 250,000.00. The further details result from Art. 51 of the Federal Lawyers'Act (BRAO). The contents of any websites referred to by means of hypertext links or otherwise have not been created by us, are not known to us in detail and are not provided by us for use as own or third-party contents. Therefore, we do not assume any responsibility or liability for the contents of any websites referred to by means of hypertext links or otherwise. The provision of such links is not connected with a legal intent.